Thanks to Third World Network, for pointing to this information, and to the Guardian, for this report covering the excising of human rights language from the Paris Climate Summit conclusions, which impacts all nations but in particular affects the poorest and most disadvantaged communities in the world. ETC Group, which, as noted on their website, “works to address the socioeconomic and ecological issues surrounding new technologies that could have an impact on the world’s poorest and most vulnerable people” and the Heinrich Boll Foundation have been sounding the alarm recently about how the synthetic biology industry–a new and growing multi-billion dollar biotech industry where new synthetic organisms can be manufactured by gene tampering and gene replacement to function as little factories–whether to output certain chemicals, or petroleum, or perfumes, or vanilla, or saffron, or anything else–is poised, not to save the world as they project, via “climate-smart agriculture” but to destroy existing eco-systems and economies, particularly in developing countries. The animation video they have recently released is very clear-cut and informative and traces how this new biotech industry could easily become a runaway train that spells catastrophe for the planet. 10:43 minutes, well-worth watching. Written and narrated by Jim Thomas. Produced by Jocelyne Clark. 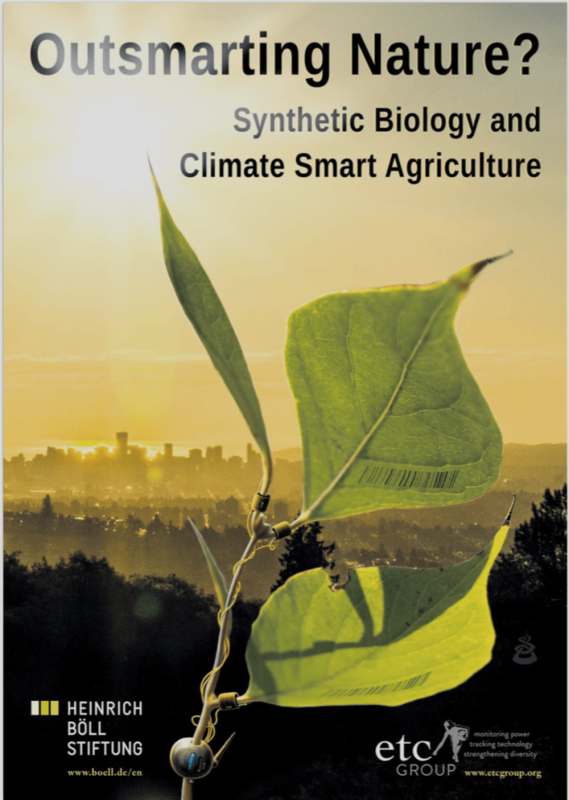 Excerpt from press release: The extreme genetic engineering industry of Synthetic biology (Syn Bio) is shrugging off earlier pretensions that it would usher in a clean, green ‘post-petroleum’ economy. Now they are partnering with big oil, coal, gas and mining interests. As the extreme biotech industry and the extreme extraction industry move towards deeper collaboration, the safety risks and climate treats emanating from both will become ever more entangled. This report details this emerging fossil-biotech alliance. Excerpt from the ETC Report, Outsmarting Nature? From the ETC Report, Outsmarting Nature? The press release from which the above is excerpted can be found here. “Climate-Smart Agriculture” or CSA is apparently a “brand” being pushed by old industrial mavens striving to camouflage themselves as green, sustainable developers in the new Global Alliance for Climate-Smart Agriculture (GACSA), and appears to be a part of the global Agenda 21/Agenda 2030 brigade, covered here in other posts. These issues in particular with reference to impacts on developing countries, ecosystems, and economies will continue to be monitored here. For updated news on these subjects, please check in regularly at ETC Group and at Third World Network. This entry was posted in Agenda 2030, Agenda 21, Global Governance, United Nations and tagged Agenda 2030, Agenda 21, agriculture, Animation video on synthetic biology, Climate Smart Agriculture, CSA, ETC Group, GACSA, Global Governance, Heinrich Boll Foundation, Jim Thomas, Jocelyne Clarke, Marie-Josee Saint-Pierre, synthetic biology, Third World Network. Bookmark the permalink.